Cambodia’s Banlung and Kâmpóng Cham are not popular tourists destinations, but a welcomed respite from Cambodia’s hectic and crazy cities. The 2.5-hour drive from Stung Treng to remote Banlung was on a better road than the previous trip, at least this road is sealed. The mini bus still stops a couple of times to pick up passengers, if not full. The minibus drops you off at the markets in Banlung. This town is not really on the Cambodian tourist merry-go-round of Siem Reap, Phnom Penh, and Sihanoukville. Most of the roads here are still dusty red dirt, with only a few sealed roads. Most of the locals are poor. 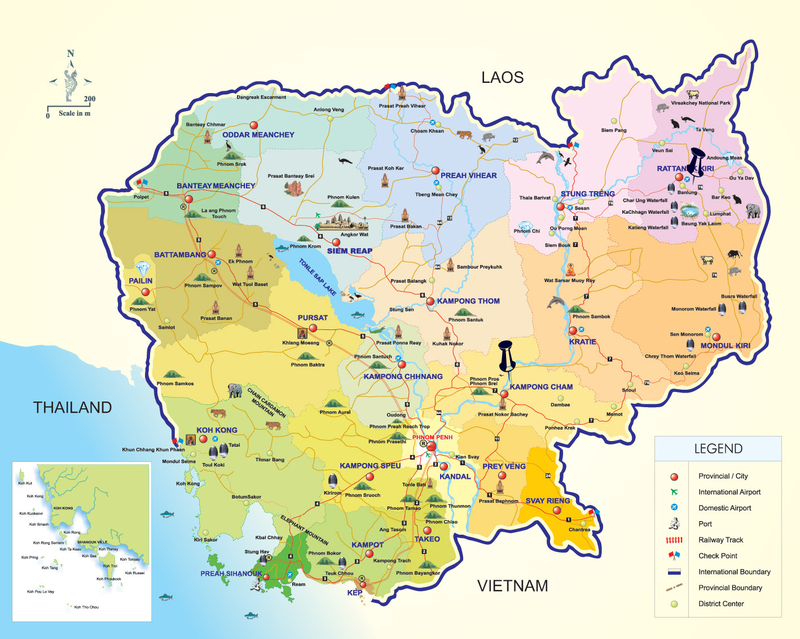 The Ratanakiri province (north-eastern Cambodia) is heavily forested and replaced with agriculture such as rubber, cashew, and oil palms. 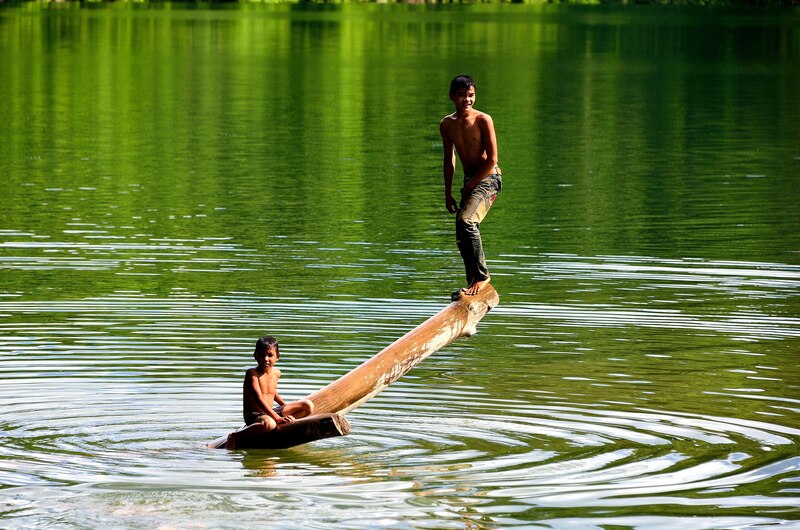 About 12 different ethnic minority groups live here. There are signs of new roads, which I guess means progress. 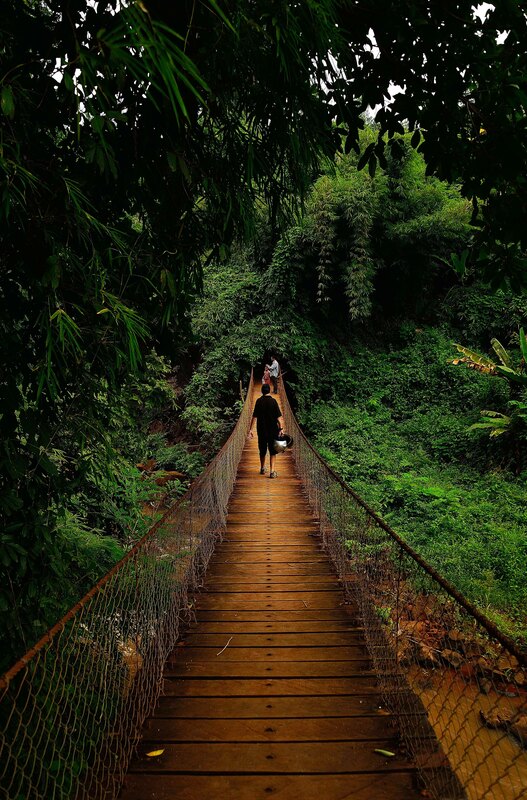 Apart from a couple of Wats in town, the surrounding area offers several worthwhile waterfalls and jungle trekking experiences. Something that I really like about Banlung is that the lack of light pollution. Typically, you can see loads of stars in the deep black night sky – just gorgeous. You’ll need your own transport or organise a day-tour to see most of the waterfalls. The cheapest way to see the lake, waterfalls, and a few other sites is to hire a scooter (USD$6/day). 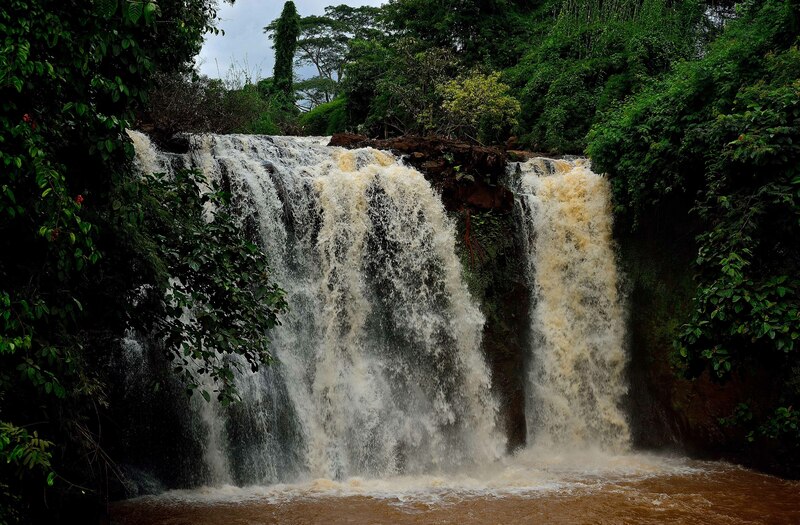 Ten metres tall and in the jungle, this picturesque waterfall allows swimming and cooling off from the oppressive heat. Approximately seven-metres in height, this waterfall empties into a large pool in which it is possible to swim. A 3,000R entry fee. Walk north-east of the town’s roundabout a couple of kilometres and you’ll run into this man-made lake. 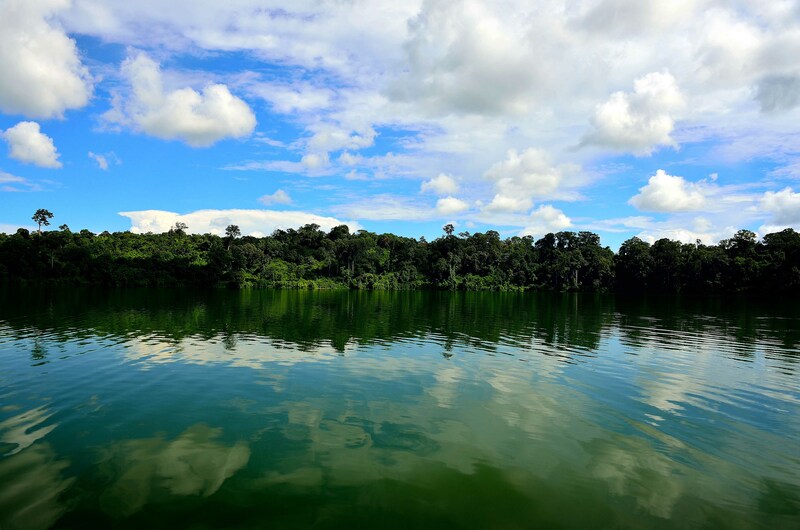 Take a stroll around this pretty lake, which is also about a couple of kilometres long. Stop off for a cooling refreshment or delicious Cambodian meal as there are many restaurants along the way. Colonial Lake Palace (Tesh Anlung, Beoung Kansaign Lake) provides a good-sized room, comfy bed, toiletries, AC, TV (with many English channels), is reasonably priced, and serviced on request. Although, no service, help, or smiles from staff. This hotel is supposed to only be 2 years old. The bathroom ceiling had a half-metre mouldy hole in the ceiling and continuously dripped water onto your head whilst on the toilet, especially as it rained a lot! Wi-fi does not work and advised: “the wi-fi is broken and don’t know when it will be fixed. Go to the Backpacker’s Pad and use wi-fi there”, which is owned by the same people. Got the feeling that the wi-fi was intentionally off so that you are pushed to using the restaurant at the Backpacker’s Pad, which is also an avenue for the owner to flog his tours. This hotel advertises two rates at reception. Hired out on an hourly basis (maximum of 3 hours) – draw your own conclusion on that one. Or an overnight rate. Understandably, there’s a list of items you have to pay for if you break things. But, USD$150 for a toilet seat is a bit steep! I paid USD$10 as I lost our room key, which was one of the cheapest charges on the list. This list also included “blood” charges – interesting. As always, you’re spoilt with food choices in Cambodia. Just off Main Street, this restaurant serves western and local yummy food (mains USD$3, shakes USD$1, Cambodian beer USD$0.75), coffee is good (USD$1), atmosphere is relaxed, excellent service, and friendly staff. Owners are pleasant and very helpful! This has the right mix to make things work but most of all, Mr Tommy’s restaurant trains disadvantaged kids in hospitality for 2 years then sets them up on their own; very admirable cause! Stumbled on this cafe on #25, Road #78A, Chey Chomneas Village, as the guide book is not updated and everything has moved. Very good coffee and yummy snacks. Good music, many food options on the menu, peaceful and relaxed atmosphere. Owners are very nice. Great staff and friendly. Great for cheap local freshly made food and weird trinkets – not touristy. Don’t be afraid to try everything – I draw the line at dog, cat, and rat. But, don’t eat the local wildlife as this only encourages poaching. Sticky rice in lovely little woven baskets is also available, which I love. Keep your eye out for street stalls with glass cabinets selling semi-precious gems, north of this market. You need to know the difference between cut glass and real stones before buying – barter hard. Buying the Neak Krorhorm Transportation bus ticket from Banlung to Kâmpóng Cham (USD$10 includes hotel tuk-tuk pick-up) at the bus station, is without any dramas. The tuk-tuk is supposed to pick-up from the hotel around 08:00, but of course, it’s about 15 minutes late – no big deal. Tip: At the time of writing, the Canadia Bank ATM’s does not charge a withdrawal fee. Although the third largest city in Cambodia, Kâmpóng Cham runs at a quiet pace and away from the maddening crowd. 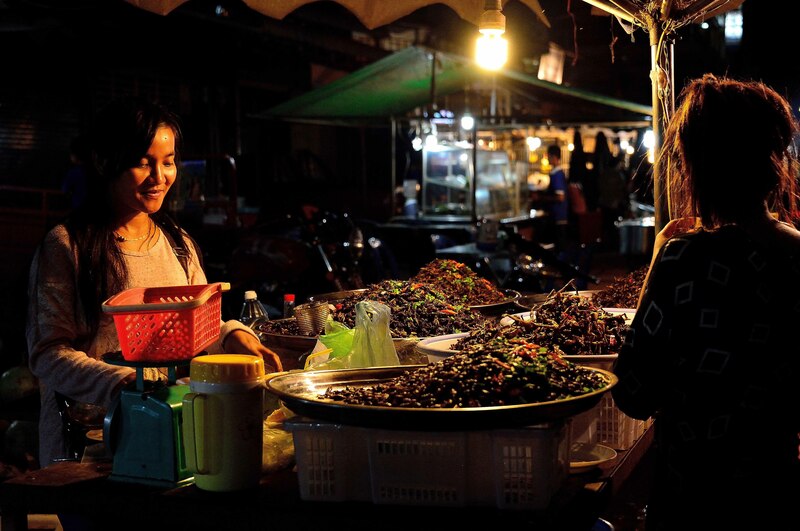 You’re not hassled walking around this city, which is more of a stop-off to break up the journey to Siem Reap. This city has always been an important trade and transportation hub. 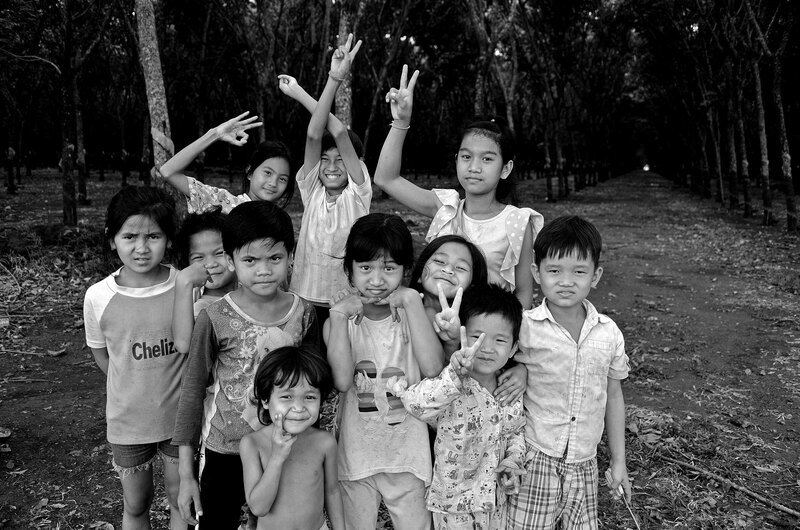 People in Kâmpóng Cham are ethnic Khmer. Although, the province’s town includes a sizeable Cham minority, an excessively high number of Muslims and Christians, and also Chinese origins. The bus from Banlung takes about 7 hours on mostly good roads, and stops only occasionally. You travel on Highway 7 back to just south of Stung Treng, before heading south and onto Kâmpóng Cham. The desolate landscape for the whole 7 hours is stark and very dry from deforestation – very sad to see so many hours without one tree. Take a stroll along the riverfront (Sihanouk Street), which is pleasant, good for people watching, and taking photos. Enjoy a bustling river scene in the mornings. Along the way, seek the ever-elusive well-advertised French Colonial architecture – good luck finding some! Stop for an icy Anchor (local) beer or a refreshing and freshly made pineapple, avocado, or mango juice – choices are almost endless. 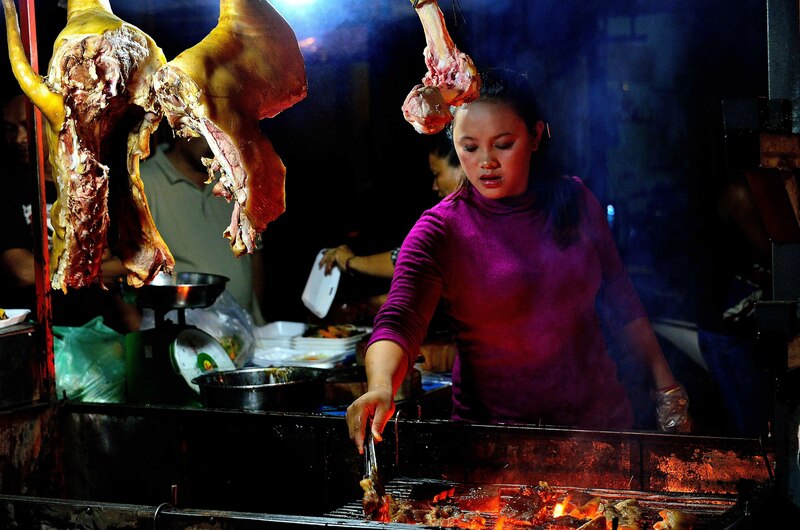 Why not indulge in a scrumptious Khmer meal? The locals are very friendly, welcoming, and always smile. Walk along the main road of this small city and it won’t be long before you strike up a conversation with a tuk-tuk driver eager to share his experiences and knowledge of Cambodia. Take the time to stop, as you’ll gain much insight from a conversation with a local. Hang around long enough and once the ‘tourist’ chat is over, politics and local resentment starts filtering through, especially bitterness towards the government corruption and how only a select few reap foreign aid money. 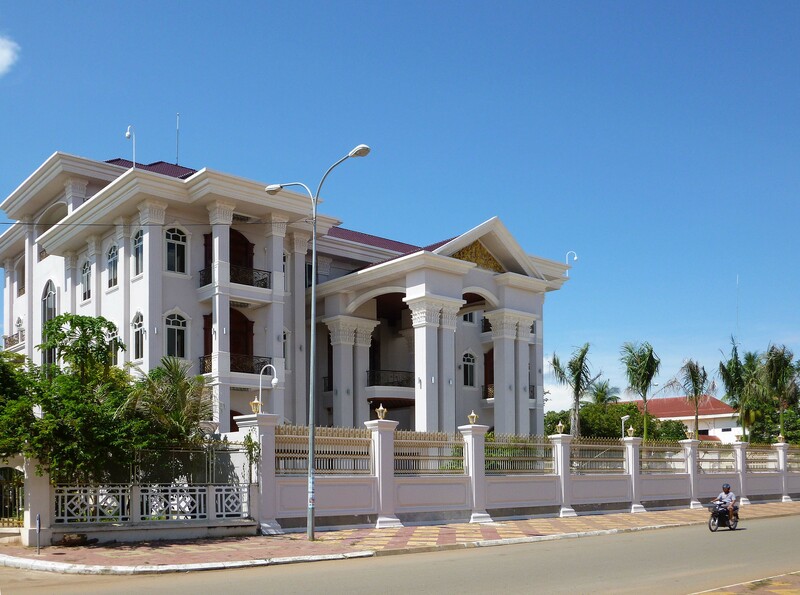 Along Preah Monivong Boulevard, you can’t but help notice two massive opulent mansions a couple of blocks from each other. The story is that they’re owned by government council guys made rich from money that should have gone to building roads and infrastructure. Surprised? Apparently, one home has a huge amount of gold in its foundations…myth or legend? Corruption and opulence at its worse! Gold buried in this mansion’s foundations. Tip: Mr Buth Gideon (buthkhmer31@yahoo.com) owns his own tuk-tuk, speaks English, and seems very pleasant. Although we didn’t go with him as already booked a tour, he charges USD$20 for a day tour of the typical sights. Leap Mong Kol Hotel – (Kampuchea Krom Street) provides an okay room on the 3rd floor with a fan but is still very hot. The bathroom could be cleaner but staff are super friendly and very helpful. You must try Cambodia’s ‘Amok’. On No.6, Street 7, Riverside 12 Village, this NGO restaurant is run by BSDA (Buddhism for Social Development Action in Kampong Cham). Providing an environment for orphans and vulnerable children to learn service and cooking skills, whilst producing the most scrumptious of meals, the menu offers delicious Khmer and western food at reasonable prices. I’ve become addicted to the national ‘Amok’ dish, which typically is curried snake fish that is steamed in banana leaves. A pure melt-in-the-mouth moment of deliciousness! But, in true Khmer accommodating style, this national dish has been changed to accommodate tourists. Fish is now replaced with a choice of chicken or beef. Stick with the traditional fish dish and you’ll soon share my addiction. Visit my Nilla’s Photography Cambodia gallery for more images. 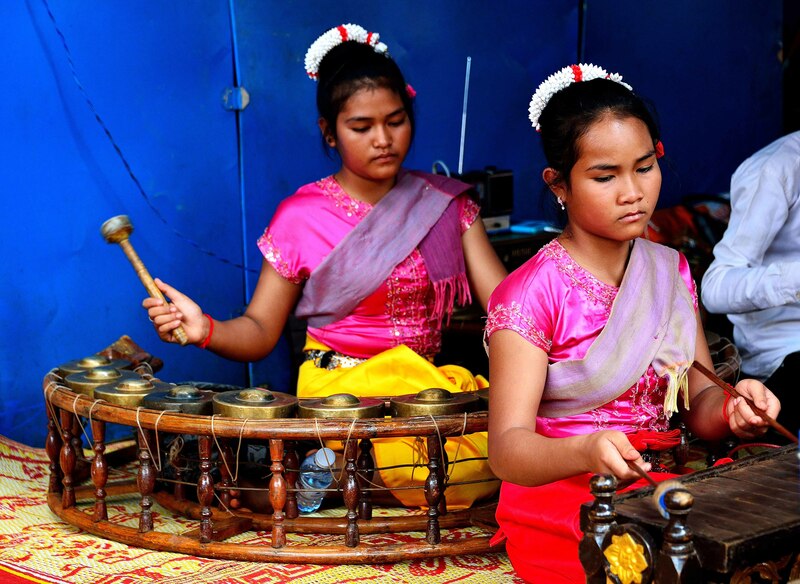 More blogs on Cambodia.